It’s been quite a while since I’ve added any new content to my blog, but I’m back! I have some new projects in the works and within the next few weeks or so I’ll be posting that info here, so stay tuned! 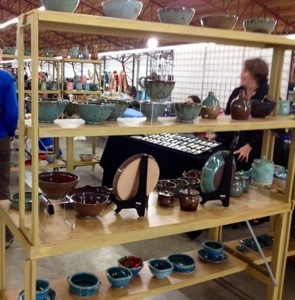 Every summer our local Arts Council has a Summer Arts Festival that’s free to the public and spans over several weeks. I thought it would be fun to have a new bag to carry on these outings to hold snacks, water bottles, etc. so, I designed this pattern/how-to for a Summer Tote Bag. Please keep in mind this design/how-to has not been tested– if you find an error or have a question, please let me know. 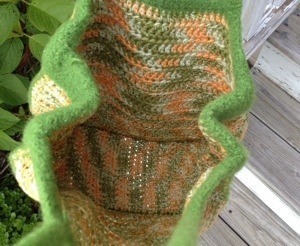 Sport weight cotton yarn—I used Omega Sinfonia in the Matizado Melon colorway, 2 skeins (approx. 436 yds), 2 strands held together. Worsted weight wool yarn—I used Stitch Nation Full O’ Sheep in the Thyme colorway, 1 skein (approx. 155 yds). 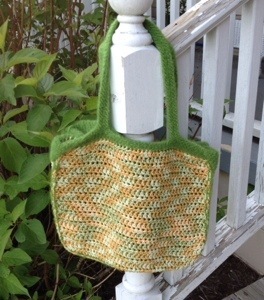 Since the body of the bag is worked in cotton yarn, it retains most of its shape (except handles and flaps). Using K hook and cotton yarn, holding two strands together, Chain 41. Row 1: Hdc in 3rd chain from hook and in each stitch across. Row 2: Ch. 2, hdc in next stitch and in each stitch across. Continue Row 2 until your piece is approximately 11” high. 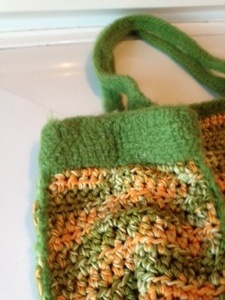 Using K hook and cotton yarn, holding two strands together, Ch. 17. Row 1: Hdc in 3rd ch from hook, across. 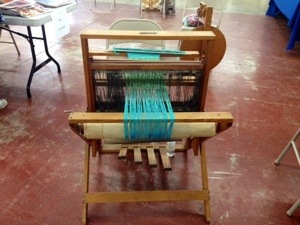 Continue Row 1 to approximately 30” in length. 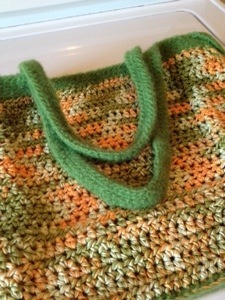 If you decide to omit the flaps, make sure your gusset is long enough to fit around the bag. Continue from * to * for 2 more rows. Finish off and repeat on other end of gusset. 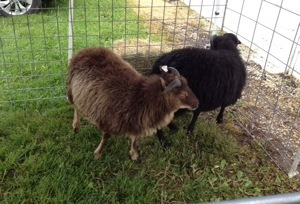 These wool rows will create the flaps on either end of the bag (see photos). Pin one flat side to fit gusset. Using wool yarn, ss pieces together. 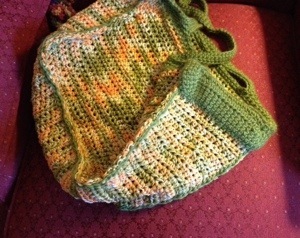 Sc around top edges of bag, including gusset and wool flaps. Round 1: Using one strand, attach wool yarn to one side edge with ss. Ch.1, sc around, including flap edges. Join with ss at end of round. Round 2: Ch. 1, sc around. Join with ss at end of round. Round 3: Ch. 1, *sc in first 10 stitches, ch. 70, skip next 19 stitches, sc in next 10 stitches. Sc around flap. Continue around to next side repeating from * to * then ss in ch1 from beginning of round. This will form your handles. If your counts are not perfect, just make sure the handles are centered. Round 4: Ch. 1, sc all the way around bag, including chains. Fasten off. Sew bottom edge of flaps to gusset sides with tapestry needle and yarn. 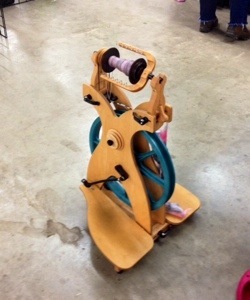 (Optional): To stabilize handles attach wool yarn with a ss on the inside of each handle and ss around. 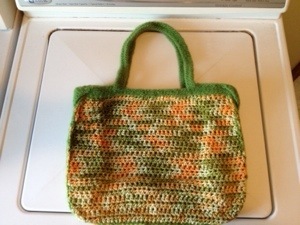 Place bag in top loading washer with a few towels. Wash (no soap) in hot water. I threw mine in the dryer for just a few minutes, then shape the bag and let air dry. Copyright May, 2014. Sally’s Backyard. 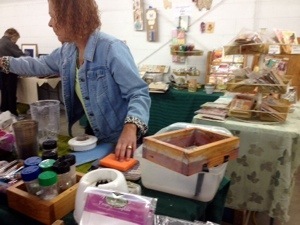 http://www.sallysbackyard.com. All rights reserved. 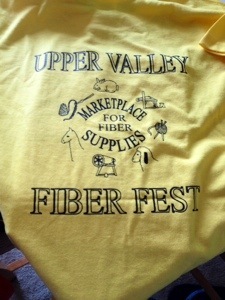 We headed out to the Upper Valley Fiber Fest in Troy, Ohio, this morning. 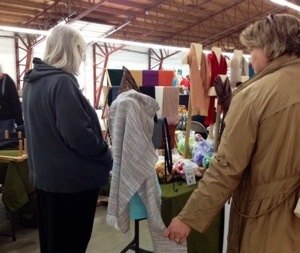 The weather was a bit rainy and cool, but this festival is held indoors at the fairgrounds. 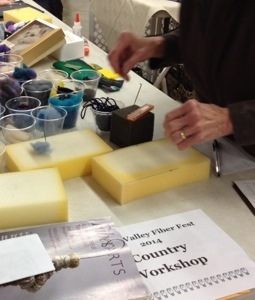 It’s not a big affair, but there is plenty of fiber and crafty fun. 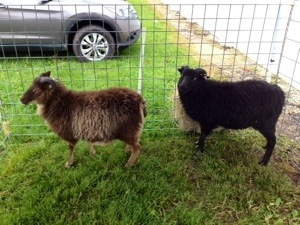 These two Icelandic Sheep met us at the entrance. 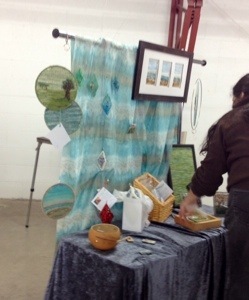 Also, some were displaying their crafts–spinning, weaving, paper making and needle felting. 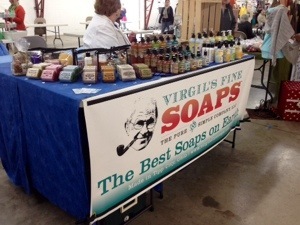 This vendor in particular caught my eye. 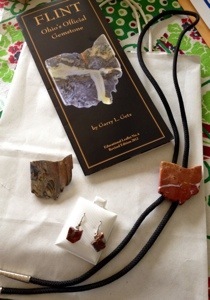 He makes all sorts of jewelry items from Ohio flint. He told us he digs the rocks, polishes and cuts them himself. I fell in love with his Ohio shaped pieces and brought home a few as gifts.